Announcement Easter Sale! 25% off through 22nd April! Please note our next shipping day will be THURSDAY 18th April, due to the Good Friday holiday in the UK. 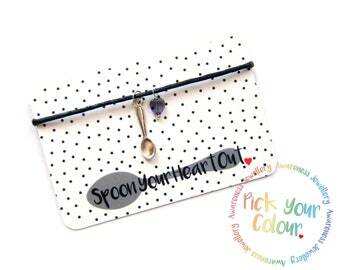 Welcome to Spoon Your Heart Out! 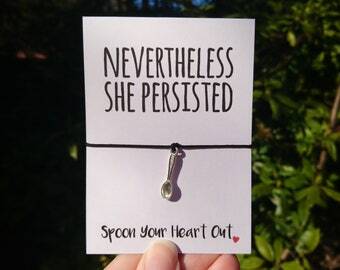 We specialise in inspirational and unique awareness jewellery, which is handmade in the UK by the "spoonie" owner (Hi!). WHOLESALE: Please contact us directly either through Etsy or SpoonUrHeartOut [!at] gmail.com to enquire about wholesale availability. We are slowly working towards being a more sustainable business and cutting out single use plastics from our packaging, and reusing and re-purposing packaging supplies where possible especially on large orders or orders only containing charms. We currently get a lot of requests for donations and can no longer accept these requests. Please bear in mind that Spoon Your Heart Out is a very small business, set up to provide income for the chronically ill owner. SYHO has been an avid charity supporter from the beginning, supporting Invest in ME for 6 and a half years as well as donating to numerous causes during this time. Our chosen charity this year is Mind, a UK based mental health charity. Easter Sale! 25% off through 22nd April! The item is just as it looks in the listing. I love my bracelet and I had a birthstone added. Very simple, very pretty. Super cute. 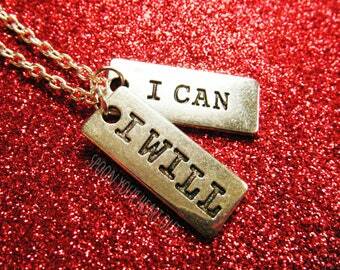 I had this added to the spoonie bracelet and have had lots of compliments. 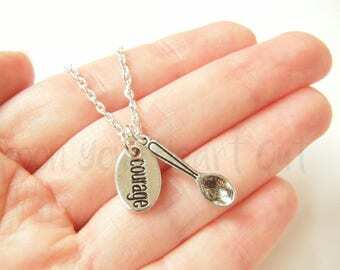 So lovely, a nice wee gift for a spoonie! Labour Day Weekend sale! Ends Monday 4th September! 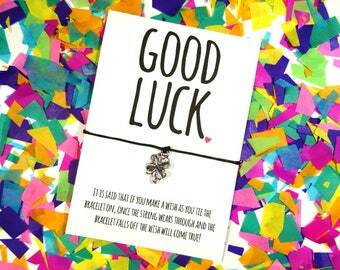 Starting to roll out the new packaging for the wish bracelets! I love making jewellery, especially pieces with meaning behind them. I get a lot of inspiration and ideas from Pinterest and am currently a big fan of inspirational and motivational messages, and have been working on ways to incorporate these into both my jewellery pieces and my business as a whole. As a chronically ill Spoonie, I know how hard it can be to maintain a feeling of positivity, capability and self worth when faced with adversity and I want to created a way for the recipients of my pieces to feel included, inspired and capable. 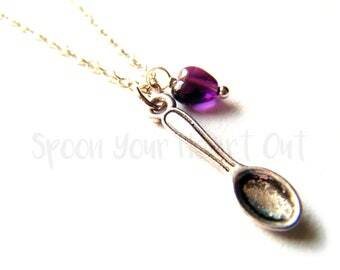 I run Spoon Your Heart Out with a little help from my Husband, and along side my sister shop Fierce Mermaids. I love being able to do a job that is both creative and compatible with my health conditions, and without the Internet and Etsy I don't know where I'd be! If you'd like to stay up to date with our new releases and see behind the scenes, come follow us on social media! Originally, my shop was called 100 Birdies for ME! and specialised in hand sewn felt bird decorations, and with the aim of making and selling 100 to raise money for the charity Invest In M.E. The target was smashed in 2013, and by the end of 2014 154 had been made and sold, and upwards of £300 raised! 100 Birdies for ME! sold on Folksy, Make ME Crafts, in a brick & mortar shop Fabrication (Leeds, UK), and finally settled on Etsy as it's home. Over time the business evolved and I started adding Spoonie jewellery lines, and eventually phased out the felt birds which were becoming increasingly difficult for me to make. 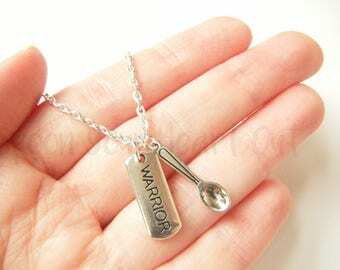 I added my first two designs, the Spoon & Heart Awareness Necklace and the Dainty Spoon Earrings, to my shop in 2012, and at the end of 2014 I decided to change my business name and focus solely on the jewellery side. I still raise money for Invest In M.E. 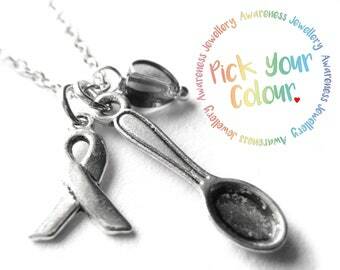 through sales of blue jewellery items – check out the charity donation section in my shop! Owner, designer, maker, photography, shop management, customer service, promotion, general admin. I've become a jack of all trades! Admin and big data entry tasks, automating processes, post office runs, moral support. To fulfil your order, you must provide certain information (which you authorised Etsy to provide to me), such as your name, email address, postal address, payment information, and the details of the product that you’re ordering. You may also choose to provide me with additional personal information (for a custom order, for example), if you contact me directly. I am not currently taking on fully custom or personalised orders at present, however many items are customisable with extra charms in the 'Customise It' section. Please contact me directly either through Etsy Conversations or SpoonUrHeartOut@gmail.com to enquire about wholesale availability. Why haven't I been given a tracking number? Standard shipping is by 1st class within the UK and Airmail for International orders, neither of which come with tracking. If you would like tracking I would highly recommend using the shipping upgrade. Help! I've given the wrong address! Please contact me as soon as possible if this happens! If the order hasn't shipped yet it can be amended. Shipped orders will not be resent or refunded. It is your job to ensure your address is correct at checkout!! My dispatch times are currently set at 1 to 3 business days (ie weekends not included). This is to ensure I can always meet order deadlines as I am chronically ill and not always able to get out to the Post Office. As standard, orders are usually shipped on a TUESDAY and FRIDAY. UK: your order has not arrived within two weeks. Europe & Rest of World: your order has not arrived within one month. PLEASE NOTE: These time frames are ESTIMATES ONLY, based on Royal Mail's delivery estimates. We cannot account for delays including, but not limited to, adverse weather conditions, postal strikes, customs and import delays, and general delays within the postal services. Once your order has shipped it is out of our hands and at the mercy of the mail carriers! Why haven't you replied to my conversation/email yet? Please be aware that I am based in the UK and so due to time zone differences I may not always be able to respond promptly. Also due to chronic illness I tend to work part time hours, though I will respond to messages as soon as I can. We currently get a lot of requests for donations and can no longer accept these requests. Please bear in mind that Spoon Your Heart Out is a very small business, set up to provide income to the chronically ill owner. SYHO has been an avid charity supporter from the beginning, supporting Invest in ME for 6 and a half years as well as donating to numerous causes during this time. Our chosen charity this year is Mind, a UK based mental health charity. Please note it is against Etsy's terms to contact sellers asking for donations. Repeated requests will be reported to Etsy for further action. 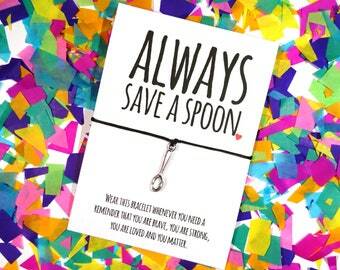 What does Spoon Your Heart Out mean? 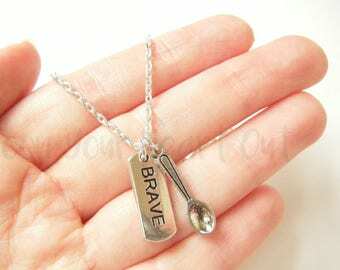 Spoon Your Heart Out is a play on words, based on my best selling Spoon & Heart necklaces, Spoonies, Spoon Theory and "spooning". I'm aware it can sound a little weird! Currently we are working towards becoming more sustainable and reducing single use plastic within the business. These changes take time though! We currently recycle paper and card, and reuse packaging materials where possible, especially on larger/wholesale orders and orders containing only charms.